Lyle, Washington In south-central Washington, the wild Klickitat River, one of the longest undammed rivers in the Pacific Northwest, flows 95 miles to the Columbia River. Just below Lyle Falls, near the town of Lyle at the mouth of the Columbia, the Yakama Nation tribal members set up their fishing spots along the rocky canyons above. Scott Spino, a member of the Yakama Nation tribe explains the importance of the Klickitat River providing both a sense of identity for his tribe, and for their livelihood. They typically use traditional dip nets for fishing: a 28' long pole with a 9' netted hoop at the end, that when extended into the fast moving current, is designed (along with the requisite skill of the experienced fisher) to catch 4 or 5 fish in a single haul. Scott Spino explains, "[We] throw the pole upriver, from the spot where you are standing at, and then it goes down with the river, and then you feel a fish, and you feel it bump your pole, and then get into the net, you pull up as fast as you can, and hopefully you have the fish in your net. Your pole kind of shakes, and then you pull up, hopefully you are quick enough..." to catch something, he says. As the caught fish accumulate to 5 or 6 in number, some individual fish weighing as much as 25-30 pounds, the fishers place them into gunnysacks, and haul them to their cars. There, the fish are stored in ice chests as the fishing continues until (hopefully) all the tubs are filled. 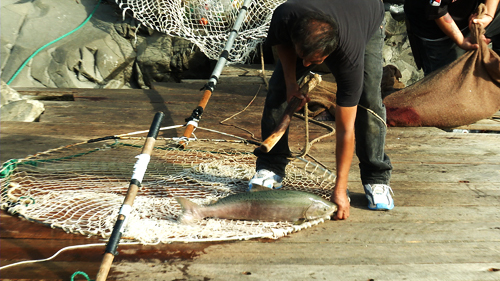 As Spino mentions during the interview, fishing is the lifeblood of the Yakama Nation tribal community. As a river tribe, many of the members fish for annual subsistence, and for revenue from commercial sales to fish buyers, and from direct private sales. The fishing season begins around the end of March, and extends through to mid-November with different runs of salmon and steelhead trout. Spino began learning how to dip net fish at about 10 years of age. He watched his grandfather, father, and older brothers before fishing himself. Though Scott works full-time during the day, he fishes at nighttime with a headlamp to collect his own harvest. As is evident from the video, the canyon walls are rugged and steep, and the wooden platforms that are built along the rocks are not easy to reach. 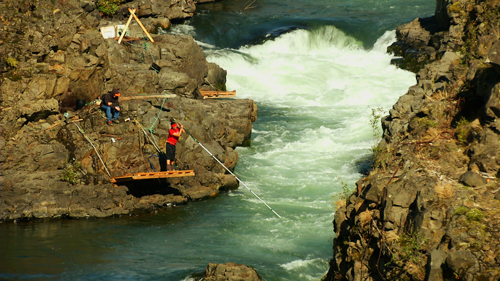 While fishing the tribal members use ropes to secure themselves to their platforms, as the raging Klickitat River is treacherous even for seasoned fishers. Originally published on Cooking Up a Story.